Originally a percussionist, Pat studied vibraphone and drums with Lou Magnano at The Berklee College of Music. After his studies at Berklee, Pat continued on for many years playing drums with various combos, performing throughout the Capital District. Around 1992, Pat took a long hiatus from music to be able to spend more time with his family, (His two sons both being fine musicians themselves). 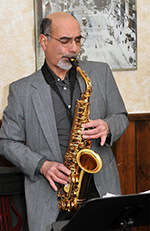 As an older adult, inspired by the music of Lou Donaldson and Paul Desmond, Pat decided to study the alto saxophone. Becoming at once "instantly addicted", saying "It's never too late to start", he encourages adults to "take up an art form and enjoy it! ".